All you need. Other brands of sugar are available. 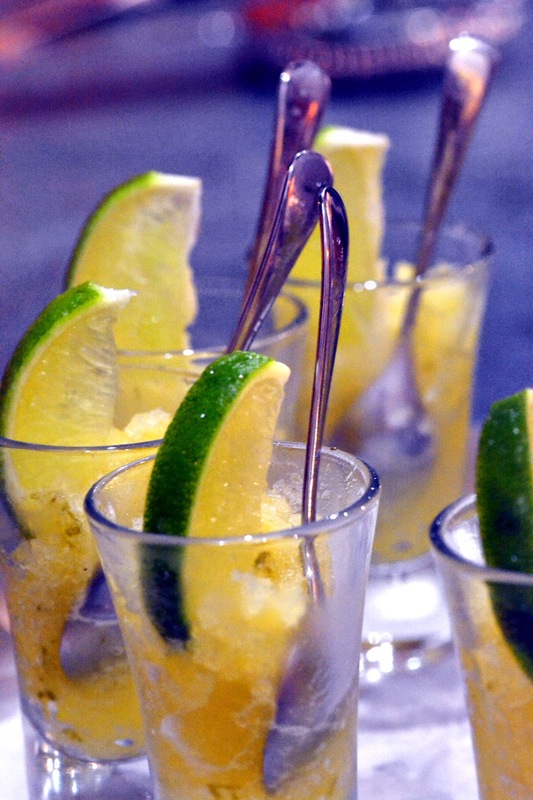 So now there's some danger of a warm evening I thought you'd like to know how to make my pineapple and lime ice. I serve this as a palate cleanser in a shot glass with a wedge of lime. There is no way of saying that without sounding effete, so I won't try. Guests squeeze the wedge onto the ice. The ice isn't poncey at all though. It's grown up Slush Puppy, and not very grown up at that. I add a lime sourness to balance the pineapple's natural and abundant sweetness. It's fantastically refreshing. Many guests tell me it was their favourite part of the meal. Better even than the lamb rack, the slow roast pork belly or the lovingly prepared beef shin. And no, that doesn't wound at all. 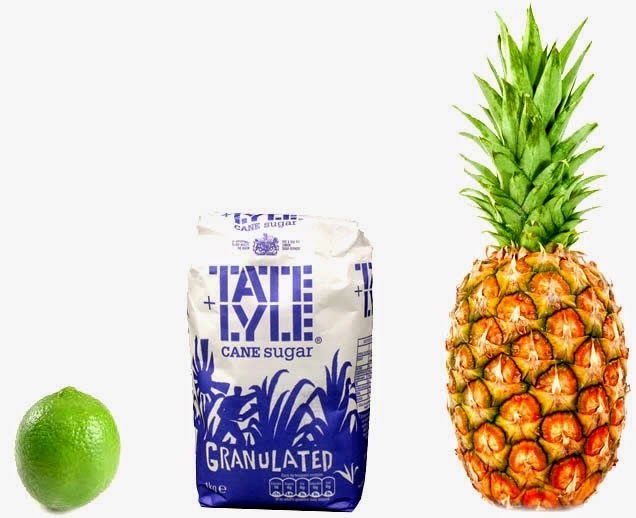 To make pineapple and lime ice you need: a pineapple, a lime and some sugar. Tah-Dah! Really that's it. You do need a juicer though but we'll get to that. First, catch your pineapple (pref Fairtrade) Make sure it's ripe by tugging at the leaves. If they come out easily it's ready but if they grip like a banker to his bonus... walk away. Using your juicer, juice your fruit. No juicer? Then mash fresh pinapple and squeeze hard in a clean tea towel. Can't be arsed? Then use a litre of not-from-concentrate*. This does taste different to freshly squeezed as they pasteurise the juice. You can, I suppose, use from-concentrate but then why not just buy a Solero and stamp on it? For each pineapple/half carton of juice you need one lime. We're going to use that to make a lime syrup. First zest the lime using a zester or grater. Do this over a pan to catch the oils. Now squeeze the lime for juice and add to the zest. Finally, add a tablespoon of sugar per lime, to the pan. Heat gently until the sugar is dissolved. Allow to cool. I tend to make this in three litre batches because making syrup from one lime is tricky and because it's no more work to make three litres as it is one. To add depth and interest, as I hope I do, steep some spices in the syrup. I use lemon grass, pink peppercorns and cloves. After a good steep, sieve your syrup, to remove the zest and spices, add to the pineapple juice and taste. Maybe a little more raw lime juice? Maybe some plain sugar syrup (equal amounts of sugar and water boiled)? Depends how sweet or sour you want it. Remember when trying to judge that chilling reduces our perception of sweetness. Pour the mix into a plastic tub, ideally with a snap lock lid, and freeze for a few hours. When the mix is starting to freeze give the tub a good shake (unless your lid isn't snap lock, in which case, stir) and return to the freezer. Do this every few hours until your ice is nicely granular. That's it. Done. It will store for weeks in the freezer. Adding a dash of tequila, rum or vodka over the ice won't kill you either. Nor will a shot of gin or Cachaca. Or Pisco. Have I laboured the point enough? *When Etien, my youngest son, was about 5, I found him peering at a carton of juice in a supermarket. "Dad? Where is Concentrate and why does no one want stuff from there?" Wonderful. (Sorry Et).